PORT-AU-PRINCE, Haiti (CNS) — For the past five years, Elouisna Francois has lived where God sent her. Never mind that it’s far from her old neighborhood in the capital — where she had made a good life until the country’s January 2010 earthquake — and that there are no basic services, like running water, sanitation or electricity. For now, home is the sprawling community known as Canaan, in the rolling hills northeast of the city. 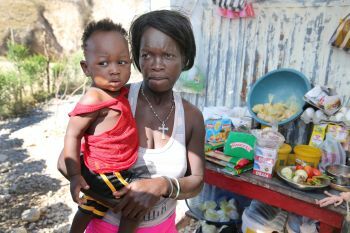 Francois said she came to Canaan with a letter stating that the government “officially handed the land to the people.” She relocated with what little she could salvage from her apartment that collapsed during the earthquake. While Francois acknowledged the drawbacks in Canaan, she said the peacefulness she experiences is more important. She travels to the city occasionally to pick up food and other items she needs to get by. “I sleep here alone. I’m not afraid,” she said. Francois is one of as many as 250,000 people who now reside in Canaan. Makeshift homes are scattered as far as the eye can see. The small structures are made of corrugated steel, plywood and pieces of heavy canvas, cut to shape from the remnants of tents distributed by aid agencies in the aftermath of the earthquake. Some residents have panoramic views of the nearby Gulf of Gonave. 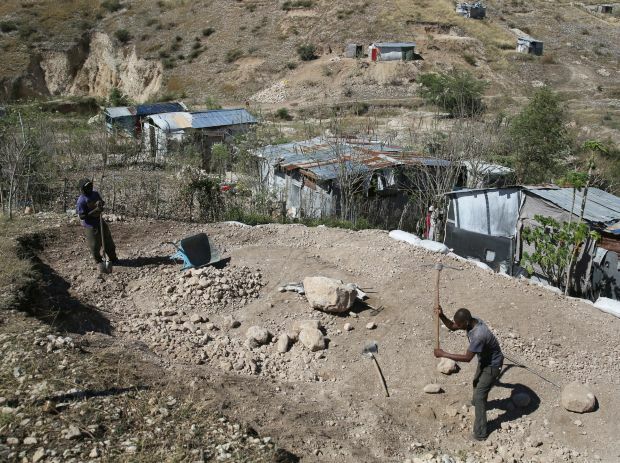 The community emerged soon after the earthquake when the government declared the rocky, dusty land about 12 miles from the Haitian capital the place where people could relocate. However, Canaan exists in a legal limbo. While residents like Francois told Catholic News Service they believe the government approved their relocation, others said they are waiting to be told they can build a permanent structure. Others have been forcibly evicted, said Dayrri Fils-Aime, a leader of one of the camp committees representing residents. He told of an incident in December 2013: More than 30 families scurried to protect their meager possessions when a group of men, backed by a bulldozer, descended on the residents and began “breaking down” the homes. The families moved a few hundred feet up the foothills, with village leaders thinking the move was temporary. Fils-Aime said the community has not heard from anyone since. The land where they once lived remained vacant in mid-February. “It’s the government not doing its job to get these people somewhere,” he said, shaking his head. The government has said the sprawling settlement is not mean to be a permanent home for the displaced. It has banned construction of permanent homes and has no plans to introduce electrical, water or sanitation services. A single police kiosk was the only government presence seen in Canaan Feb. 17 along a half-mile section of Route 1, the main road to Haiti’s coastal cities. Advocates for the residents are concerned that because of the absence of any government entities, Canaan will become a slum like the notorious Cite Soleil, where basic services and schooling are nonexistent and rival groups vie for control. “They have a right to permanent housing,” said Edouardo Ilema, a community organizer with the Force for Reflection and Action on the Cause of Housing, a network of 27 nongovernmental organizations that helps Canaan residents understand their rights to safe and decent housing under the Haitian Constitution. Much of Ilema’s work involves documenting living conditions, abuses and evictions. He said he has been attacked once and threatened several times by unidentified men while visiting residents. Ted Oswald, who with his wife shares the position of policy analyst and policy coordinator for the Mennonite Central Committee in Haiti, said a recent conference that brought together leading nongovernmental organizations focused on the housing crisis the country is facing. While no solutions were finalized, some of the organizations involved are pressing the government to make housing a higher priority, especially for displaced people. Meanwhile, former Port-au-Prince residents such as Charity Dorelian continue to get by as well as possible. Dorelian, 58, lives in a cobbled-together structure that includes two other adults and four grandchildren. She said she and her family moved to Canaan after living in a tent camp in Port-au-Prince for three years. Dorelian said it would be nice if the government would provide water and electrical service. But she’s not holding out much hope at present. 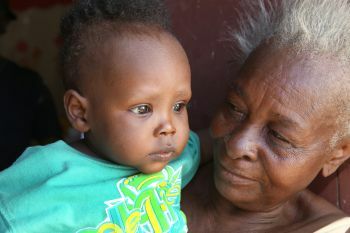 Down a hill, a bit closer to the shore, 9-month-old Gevens Jean-Pierre was snuggled in his mother’s arms as he watched his sister, Mitchellda, 12, grate a fresh carrot into a bowl on her lap. She was making juice, a mid-morning treat. His mother, Suzette, stocks a small supply of staples — vegetable oil, beans, tomatoes, onions, soap — that she sells to her neighbors from a rickety table under a black-and-white patterned bed sheet that provides shade from the hot sun. The money is paltry, but enough to help the family survive, she said. “Only God” provides hope, she said.